Bearhouse Characters are usually named after famous places or landmarks be it palaces, castles or visitors attractions right here in the UK with the exception of our two mice Madame Roquefort and indeed her butler Piccallilli they move around and frequently visit the other characters so Piccallilli is often very busy making travel arrangements and catering for Her Ladyship . 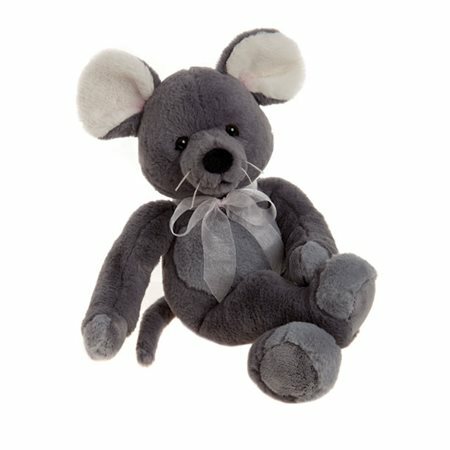 He has been created from two different plush fabrics both mousy grey in colour,he has a cute black nose and brilliant white whiskers and his ears are lined with a soft creamy white plush. He also has a long mouse tail which helps tremendously with his balance when he is rushing about. He has gently bent legs so he can sit comfortably in his chair at the end of his busy days. . All our Bearhouse Bears are also machine washable and suitable for anyone aged 18 months or older. in Charlie's words "Bearhouse Bears are delightfully cheeky non-jointed characters, created using child-friendly plush and designed to appeal to our friends of 18 months and over although they are equally at home in the arms of a grown-up collector! They are machine washable"